Since their acclaimed debut compilation on Strut in 2009, residents James Hillard, Jim Stanton, Severino and Luke Howard (aka Filthy Luka) have continued to lead the way with their packed residencies at The Eagle, London, Lux in Lisbon, Tape in Berlin and Cihan in Istanbul. During 2010, as well as revisiting UK festivals like Glastonbury, Lovebox and T In The Park, they will be spreading the disco love to some of the world’s leading festivals also so watch this space! 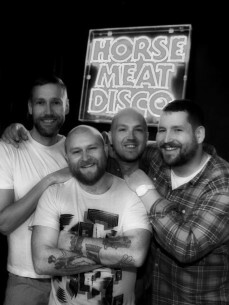 Horse Meat Disco Volume 2 brings together another essential selection of New York classics alongside a host of lesser known discoveries for all fans of underground disco. Anthems include Zanzibar favourite ‘You Can Get Over’ by Stephanie Mills, Italo staple ‘Walkman’ by Kasso and Rinder & Lewis’ ‘Afrodesia’ under their El Coco pseudonym. Rarities include ‘I’m Not In Love (Girl You’re In Love)’ by Freda Payne’s sister Scherrie, ‘Cherchez Pas’ by Swedish model-turned-singer Madleen Kane and Italo oddity ‘’Touch Me Now’ by Bravo.